Sugar is not evil but I do believe it’s less than virtuous. I also believe that it is overeaten in a disturbingly high quantity. Sugar is everywhere. Everywhere except my kitchen. I love dessert and make it regularly but instead of sugar my goods are sweetened with alternatives that also provide minerals and vitamins. Stevia is made from an extremely sweet herb. You may be more familiar with the white powder version, which has been highly processed and concentrated. In it’s natural, green, minimally processed state stevia is full of phytochemicals. The green stuff is not as sweet as the refined, white powder, which makes it easier to work it (less likely to overdo). Look for: green stevia powder and start small, it’s nearly impossible to counteract the taste of too much! Uses: I like stevia best in baked goods or mixed into plain yogurt or unsweetened chocolate when I want it a little less tart/bitter. Note that I never use an exact measurement for stevia on the blog, this is because the sweetness of stevia varies greatly depending on the brand and processing. Molasses is made from cane sugar but unlike refined sugar it retains many trace minerals and vitamins. Look for: blackstrap and organic. Uses: As a kid I got warm milk with molasses in my bottle before bed. My friend’s 2-year-old drinks this from her sippy cup first thing in the morning and calls it her “special milk”. My favorite way to use molasses these days is to drizzle a little over some plain yogurt and top with a few slices of banana and a sprinkle of cinnamon. Honey is made by bees from the nectar of flowers. It contains many trace vitamins and minerals and has unparalleled anti-fungal, antibacterial, and antiviral properties. Look for: local, raw, 100% pure honey. Uses: I love honey and think it’s good for anytime you want to add a little sweetness. Think coffee, salad dressings, yogurt, smoothies, as well as baked goods. Dates are grown on a type of palm tree and do especially well in the Middle East, Northern Africa, and the Southwest USA. Like all dried fruits, dates are full of vitamins, minerals, fiber, and phytochemicals. Look for: softer dates are easier to work with. Uses: stuff ’em with soft cheese, chop ’em in salad, process to a paste for baked goods. 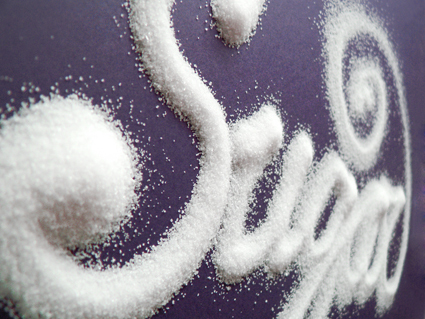 Do you ‘watch’ the refined sugar in your diet? What are your favorite alternatives to the white stuff? This is a great post. Thanks for such an informative take on sweetness. Do you have a favorite/known-pure brand of stevia?? Unfortunately no, the only place I’ve seen the green stuff is in the bulk bins at my local health food store. I don’t remember the brand, maybe Frontier? I love this! I often also use Sucanat (I don’t know how I can make a simple cookie the right texture without a dry sugar), raw organic agave nectar (the raw form is processed more like maple syrup, plus it’s not exactly new–it was a staple in Mesoamerican cultures. I even have an agave plant growing in my back yard. I’d likely never try to process anything from it though! ), and organic maple syrup. I definitely follow the idea that all sugars, even “less processed” sugars should be eaten in moderation, so I have a larger pool of acceptable white sugar alternatives than other people, and I’m okay with that. 🙂 One of these days I’d like to try my hand and growing a stevia plant. I didn’t like the few stevia-sweetened stuff I have tried, but that could be to the highly processed and impure nature of those products. I grew stevia last summer but the bugs and critters ate all the leaves! It’s so sweet they just went nuts on it! I love maple syrup and so does my husband, whenever we have it in the house he practically drinks it so it doesn’t stay around long. I’m working on a ‘sugar’ cookie made with honey so I’ll let you know if I ever get it right! Yes! It is not as good as it seems….it’s pretty bad for you actually. Thanks for the link Lindsey, I heard some not so great stuff about agave when it first started becoming popular and never got into it. I have recently been using coconut sugar; to me it tastes like brown sugar and it provides the right texture for cookies! It is made of coconut sap that has been granulated. I’ve been eyeing coconut sugar for months, maybe it’s time to take the plunge! I grew up drinking molasses and milk as well! In fact, I was 8 years old before I even learned there was such thing as chocolate milk. I gave it to my little ones when they were younger and they loved it too. They’re not as into it anymore, but that’s because they’re not big milk drinkers. I haven’t used stevia at all but I think I will try it soon. Thanks for all the info about it. I didn’t know about the less refined green stuff. I think I have only seen the refined white stevia. When I got honey bees a couple years ago I started reading articles about honey and where it comes from. It’s so sad that so much of the honey sold in stores is really processed, from really far away, and sometimes not even honey at all. After getting honey from my backyard, I will never buy anything other than raw local honey. I know, the honey thing is crazy! Have you written on your blog about it? Beautiful pictures in this post! I have never seen green Stevia. We use a lot of honey and maple syrup in my house. And I have recently discovered how great dates can be in desserts. I’ve made a pie crust with dates and nuts and love it! Thanks Jamie! Dates make an awesome crust, check out my Berry Bliss tarts, I’m sure it’s similar to what you made. What did you fill your crust with? There is also a natural sweetener that comes from a chinese fruit, called Luo Han Guo, sometimes spelled Lo Han. It is low calorie and doesn’t raise the blood sugar. I use it and stevia as my healthy sweetening alternatives. I love honey and maple syrup too, but they have sugar content which you do have to metabolize. I absolutely love honey in my smoothies.